Looking back at all the shows I've seen, this has to be the least satisfying set list of any I've heard. I got tickets early but still sat at the back of the arena on the third level. Not my favorite show for a lot of reasons. Make note: 11/7/87 was cancelled and rescheduled to this night. Sold so well they added the next night. I went to both. Enjoyed the 23 more so. Peace. 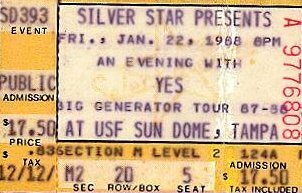 THIS WAS AN AWESOME SHOW, MY FIRST TIME SEEING YES. I REMEMBER WALKING AROUND THE UPPER LEVEL OF THE SUN DOME CHECKING IT OUT AND THE SOUND WAS GOOD FOE A ROUND DOME LIKE THAT. I RECALL PEOPLE BEING MORE RECEPTIVE TO EACH OTHER THAN ALOT OF OTHER SHOWS I HAD EVER BEEN TO AT THE TIME. WE DROVE FROM THE SPACE COAST FOR THIS SHOW AND IT WAS WELL WORTH IT. SQUIRE DID AMAZING GRACE W/FOOTPEDALS FOR AN AWESOME LOW END I HAD NOT HEARD BEFORE. This show was certainly not cancelled. I still have my ticket stub from the show and I do recall that it was an awesome show. This show wasn't cancelled...I still have my ticket stub from it and the show was awesome! Great sound from the band although the Sun Dome isn't the best place for a concert.